Menu – Folks, whack 'em. As I am typing this, I am still in disbelief that I am three posts away from being done with Project 54. Done from this semester. Done from my first semester ever at VCU. I know it probably is not a big deal, but for me it kinda is. Looking back to my first post, I wrote something about menu and restaurant. So this is my promise to me 13 weeks ago: exploring the possibility of Volkswagen as a restaurant and what would the menu look like. This one’s a bit tricky because I could list the ‘ingredients’ of the car, or a brief descriptions of each car, or both. I ended up doing the brief descriptions one. 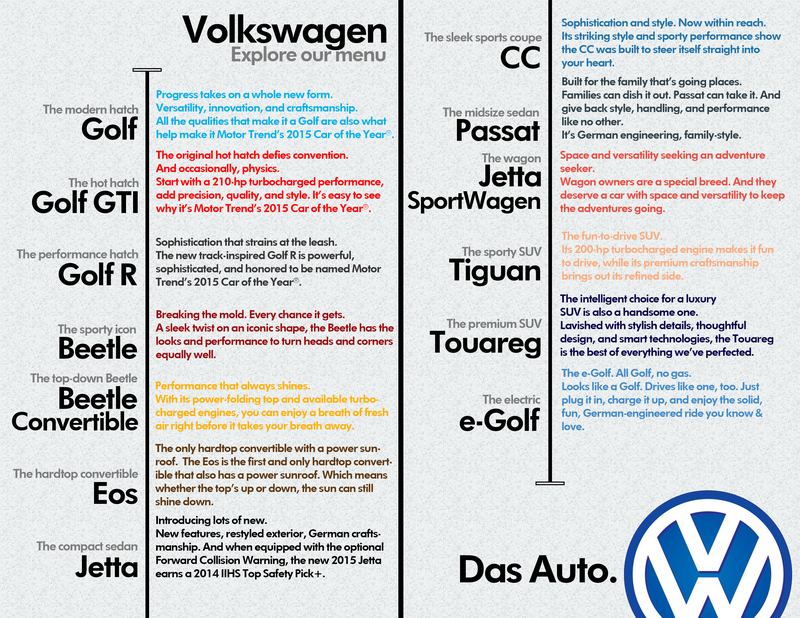 I created this ‘menu’ of the restaurant, Volkswagen. Their dishes consist of the types of their current cars. I didn’t put in the price because I feel like they would be the type of restaurant who knows their value so they won’t bother to include the price information. This is how I imagined the brief interaction between the guest and the server.